Nigerian president Goodluck Jonathan on Monday night ordered a full-scale investigation into reports of massive civilian casualties in the weekend crossfire between military officers and suspected Boko Haram members at Baga. One hundred and eighty five people were confirmed dead in the weekend crossfire in Nigeria. The statement, signed by spokesperson of the president Reuben Abati, said the president issued the directive, having received preliminary briefings from the Military High Command on the incident. “The president assured Nigerians and the global community that the federal government places the highest possible value on the lives of all the citizens of the country,” the statement said. Rules of engagement for the military and security agencies are already in place for this purpose, the statement assured. Jonathan has expressed hope that the National Committee, which will be inaugurated on Wednesday, for dialogue would contribute significantly to ending the continuous loss of lives to wasteful violence. At least 185 people were confirmed dead in the weekend crossfire between the military and Boko Haram sect in Baga, a fishing community located in Nigeria’s northeastern Borno State, according to military authorities. 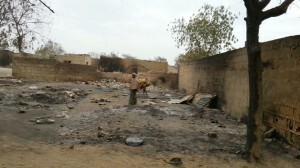 According to a Commander of the Multinational Military Joint Task Force of Nigeria, Niger and Lake Chad, Austin Edokpaye, hell was let loose after the insurgents near a mosque in the area opened fire on a military patrol team and killed an officer in the process.